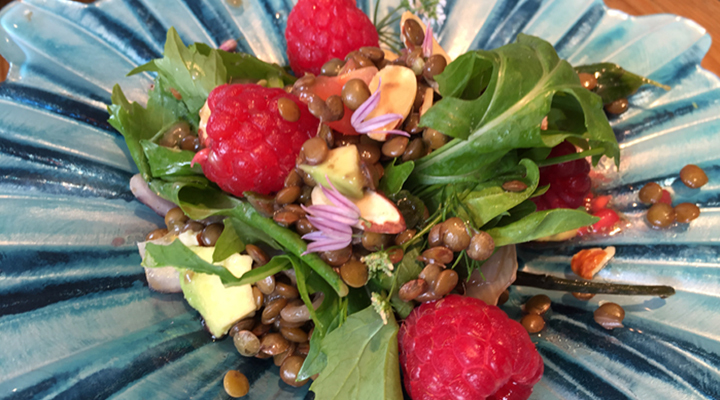 Raspberries are used as a dressing and kick to the salad and the avocado brings the creaminess. Remember to rinse the cooked lentils to bring back their shine. Place lentils and the vegetable stock in a large pan. Add the carrot, garlic and shallot and season well. Bring to the boil, reduce the heat to low and simmer for 20 minutes or until just tender and the liquid is almost absorbed. Rinse under cold water and drain. Transfer to a large bowl. In a pestle and mortar, crush about 5 raspberries with salt and pepper. Add the cider vinegar and the oil. Check the seasoning and drizzle over the lentil salad. Then, add the rest of the raspberries, chives, mizuna and the chopped avocado. Gently toss, cover and serve within 2 - 3 hours.